(Bloomberg) – South Africa’s Economic Freedom Fighters, the country’s second-largest opposition party, is positioning itself as king-maker in this year’s general election, promising to nationalise all land, banks and mines and double welfare payouts in its bid to lure voters and ensure the ruling African National Congress loses its majority. The ANC is set to win about 60% of the vote in parliamentary elections expected to take place in May, followed by the opposition Democratic Alliance with 22% and the EFF on 10%, according to a survey carried out by the South African Institute of Race Relations from Nov. 26-Dec. 4. In a stadium filled to capacity with at least 18,000 supporters, the EFF pledged Saturday to place all land under the custodianship of the state and to nationalise mines and banks without compensation. The party also wants to double the country’s R150bn ($11.3bn) welfare program. 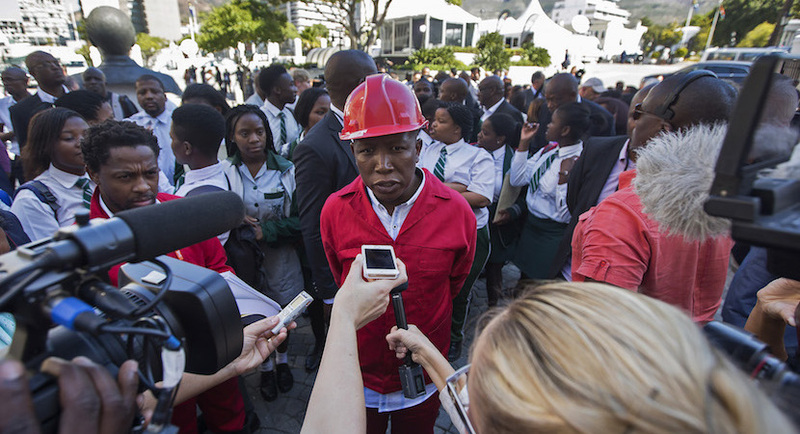 The EFF, known for its abrasive politics and brawling tactics in parliament, was established in 2013 by Malema, the 37-year-old former leader of the ANC’s youth wing. The party positioned itself as king-maker in the 2016 local government elections, forming coalitions that shifted power away from the ANC in Pretoria and in the country’s economic hub, Johannesburg. The EFF now wants to do the same in the highly contested Gauteng and North West provinces. “The ANC, the Democratic Alliance and all other parties will have to come to the EFF if they want to form a coalition government,” Hlophe-Maxon said. The party became the second-largest opposition force in its maiden election five years ago, with its policies resonating among black township residents whose standard of living has improved little since the end of apartheid. It won 6 percent of the vote in the last national elections, held in 2014, and has recently suffered a series of scandals that have dented its reputation as a voice of the poor.